CPP's exclusive spindle design lowers cars a full 2" without affecting the steering or suspension geometry. The unique design accepts factory ball joints and stock steering arms. 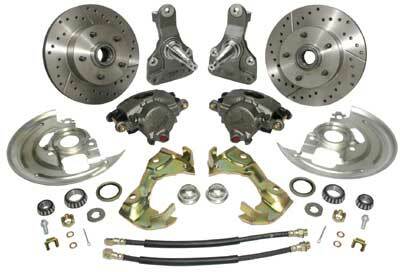 Kit comes complete with 2" modular drop spindles, modified caliper mounting brackets, modified dust shields, loaded calipers, 11" rotors, bearings, seals, brake hoses and all mounting hardware.